Each year London’s Serpentine Gallery commissions the world's most innovative architects to design their central pavilion, which is always a beacon of modern design. In 2005 Alvaro Siza Vieira, Eduardo Souto de Moura and Ceil Balmond Arup teamed up to develop a solar-powered timber and metal pavilion that created a relationship between the gallery and the trees while providing a space for both public and private use. During the day, the open structure served as a comfortable café that offered light fare and coffee to visitors to the gallery and to Hyde Park. The open plan of the timber “legs” allowed for natural ventilation through cross breezes that circulated the interior. The interior tables were designed by Siza. Visitors seated at the tables could see clear across the park through the timber legs. Affixed with traditional woodworking mortise and tenon joints, the pavilion was kept secure with heavy bolts. The timber and metal frame was filled out with panes of polycarbonate, which create a scale-like exterior. Jutting up in slightly asymmetrical patterns, the panels formed a shell-like structure. 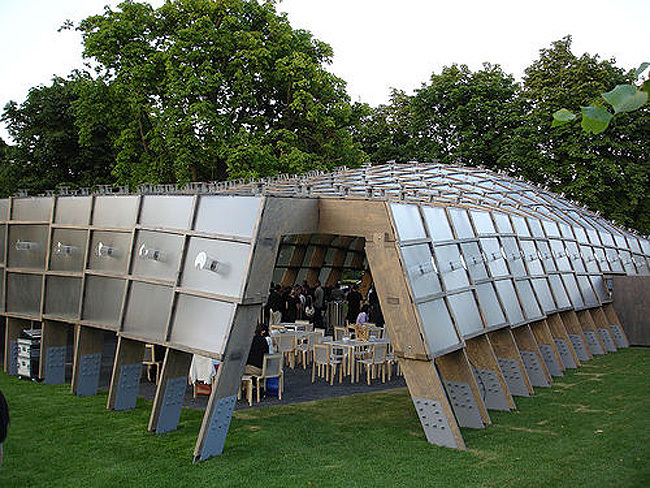 The roof of the pavilion undulates in a slight irregular curve that resembled an armadillo reaching up to meet the surrounding trees while standing on sturdy legs. Closer inspection reveals that the panels and timber legs are all different sizes — this is what creates the fluid shape. Polycarbonate is a semi-opaque material that glows when sunlight hits it and casts tree shadows during the day. Solar panels in the center of each roof panel soak up power, which is used to illuminate the pavilion at dusk. The pavilion was designed in Portugal, engineered in England, and fabricated in Germany using Finnish technology, fusing diverse elements of European design into one project. 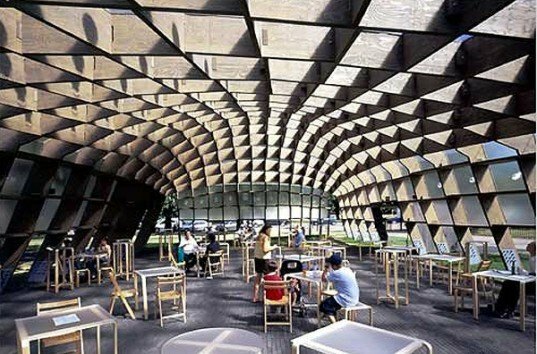 The innovative multi-use temporary design is an inspiring example of architecture that rivals the Serpentine Gallery’s art exhibitions. During the day, the open structure served as a comfortable café that offered light fare and coffee to visitors to the gallery and to Hyde Park. The open plan of the timber “legs” allowed for natural ventilation through cross breezes that circulated the interior. The interior tables were designed by Siza. Visitors seated at the tables could see clear across the park through the timber legs. The open plan of the timber “legs” allowed for natural ventilation through cross breezes that circulated the interior. The interior tables were designed by Siza. Visitors seated at the tables could see clear across the park through the timber legs. Affixed with traditional woodworking mortise and tenon joints, the pavilion was kept secure with heavy bolts. The timber and metal frame was filled out with panes of polycarbonate, which create a scale-like exterior. Jutting up in slightly asymmetrical patterns, the panels formed a shell-like structure. The roof of the pavilion undulates in a slight irregular curve that resembled an armadillo reaching up to meet the surrounding trees while standing on sturdy legs. Closer inspection reveals that the panels and timber legs are all different sizes -- this is what creates the fluid shape. Polycarbonate is a semi-opaque material that glows when sunlight hits it and casts tree shadows during the day. Solar panels in the center of each roof panel soak up power, which is used to illuminate the pavilion at dusk.